You have challenging compliance requirements, not enough time to get audits done, and keeping up with risk assessments is a continuous problem. Reduce the time you need to satisfy requirements to meet compliance goals with pre-built requirements templates for the most widely used regulations. 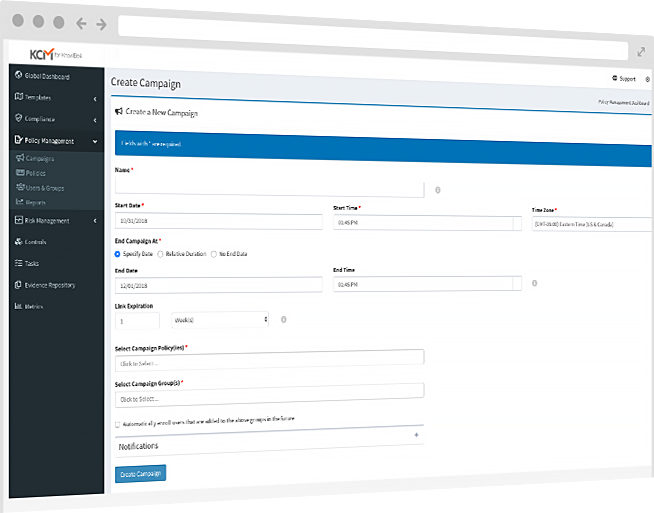 Save time when you manage distribution of policies and track attestation through campaigns. Simplify risk initiatives with an easy-to-use wizard with risk workflow based on the well-recognized NIST 800-30. Easily prequalify, assess, and conduct remediation to continually monitor and keep track of your vendors’ risk requirements. KCM effectively reduces the time you need to satisfy all of the requirements necessary to meet risk and compliance goals, leading to significantly less time and money spent dealing with compliance and audits. KCM provides a central repository to store, organize, distribute, and acknowledge your compliance policies. You can easily track and manage your policy distribution and user acknowledgement. KCM makes it easy to manage the entire lifecycle of your vendors from onboarding to offboarding to ensure that organizations are compliant while doing business with you and don’t retain your data once the relationship has ended. The KCM Dashboards are simple to use and easy to understand. They allow you to quickly see what tasks have been completed, tasks that were not met, and tasks that are past due. With an intuitive interface, getting insight into your organization's risk is easy. KCM risk module integrates with the compliance module and allows compliance or audit gaps to be escalated to the risk register. Finally, an affordable and simple GRC platform! Most organizations use spreadsheets, documents and collaboration portals, as well as email threats and individual calendars to manage their GRC initiatives. This is inefficient, error prone, costly, and a risk in itself. Streamline your compliance, risk, and audit management with KCM GRC. We all know that compliance is mainly a matter of “people and processes” and tools come second. However, old-school GRC offerings require many months of implementation and high consulting hours to stand up. KCM GRC has a simple, intuitive user interface, easy to understand workflows, a short learning curve, and will be fully functional in a matter of days. The KCM GRC platform was developed to save you the maximum amount of time getting GRC done. KCM is a SaaS-based GRC platform that is surprisingly affordable and super easy to use. Now you can move beyond using spreadsheets and manual processes that are time consuming and unmanageable. With KCM, you can effectively and efficiently manage risk and compliance within your organization and get insight into gaps within your security program. Today, most organizations are required to follow some type of regulation. Almost all of us need to comply with PCI-DSS, but often that is combined with other regulations such as HIPAA. Even if you are not required by law to comply with any regulations, you may be following an internal risk framework, internal policies & procedures, or an industry best practices framework such as NIST or ISO. Managing compliance for one regulation or framework is time consuming. Having multiple regulations sometimes means you have to create an entire and expensive compliance department. 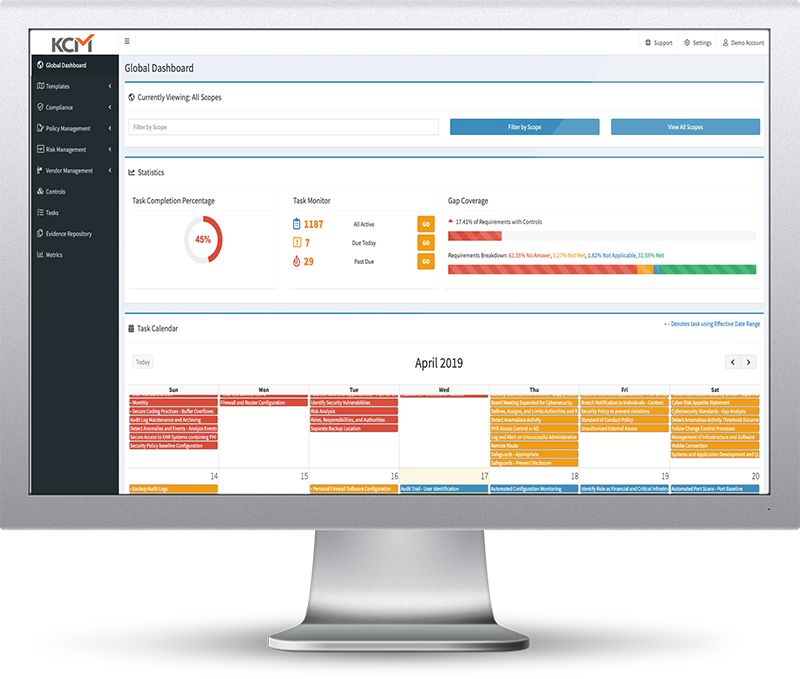 The KCM Compliance Management module effectively reduces the time you need to satisfy all of the requirements necessary to meet compliance goals, leading to significantly less time and money spent dealing with compliance and audits. Using the built-in quick setup capability, KCM can have you on your way to improved compliance fast. Whether you need to comply with PCI, HIPAA , or other Regulations or Frameworks, KnowBe4′s Experts have created pre-built requirements templates for the most widely used regulations and create new templates as regulations change or are updated… there is no need for you to monitor confusing changes in regulations any more. The following is a list of some of the pre-built compliance requirement templates offered for KCM. In addition, customers can build or import your own using KCM's super easy custom template feature. And sometimes you want to build your own template! You can do that too. Managing policy distribution and tracking attestation can be a challenging and time-consuming process. KCM's Policy Management module enables you to centralize this process and easily review metrics. KCM allows you to upload a finalized policy, select a targeted list of users, and generate user reports to satisfy compliance requirements. You can set up policy campaigns to help manage policy distribution, reminders, and user acknowledgement. Automate your policy management workflow with automated notifications, tasks, and reminders prompted by any event you like, such as an upcoming review date. Ensure that everyone’s up to speed on new and existing policies by assigning out policy attestations through the policy management module. KCM simplifies the risk management process. 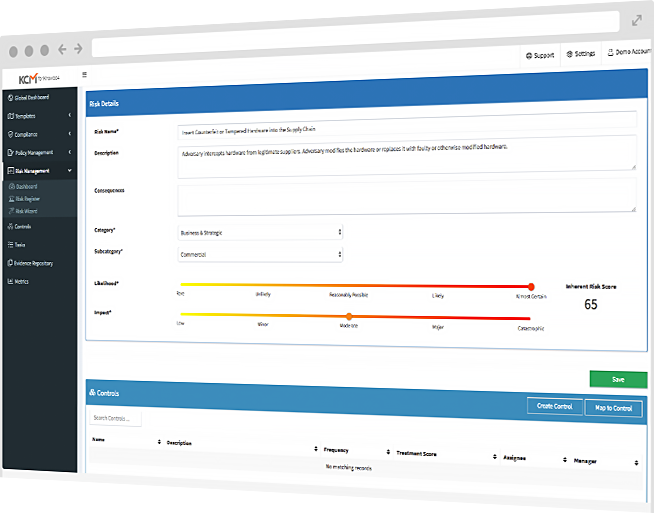 With an intuitive interface (and wizards, if you need them), getting insight into your organization's risk just became easier with KCM’s Risk Management module. Our risk management workflow is simple: identify the risk, respond to the risk and monitor the risk. The KCM risk workflow is based on the well-recognized NIST 800-30. With the inclusion of a risk wizard, adding risks becomes easy. Already working with spreadsheets? Import them into the risk register or manually create unique organizational risks. The risk module integrates with the compliance module by allowing compliance or audit gaps to be escalated to the risk register. Easily collaborate with team members to identify and manage your organizational risk. 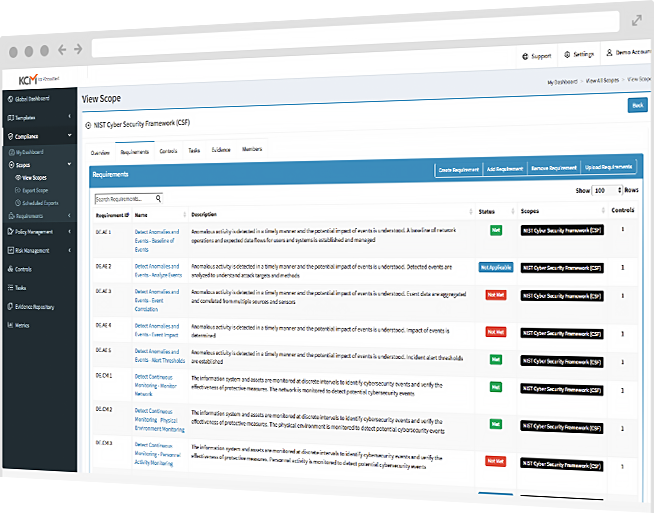 Link existing controls from the repositories you’ve created to leverage ongoing risk reduction initiatives. Tie implementation of controls, treatment scores to determine your residual risk. Ensure the appropriate personnel are engaged and informed with task assignments and reminders. Leverage KCM to determine ongoing effectiveness. You can schedule ongoing tasks to ensure controls are being assessed and get insights into risks with the risk dashboard. With KCM Risk Management, you can simplify and streamline your risk initiatives resulting in better visibility and increased efficiency. Ultimately, this leads to a more resilient organization. 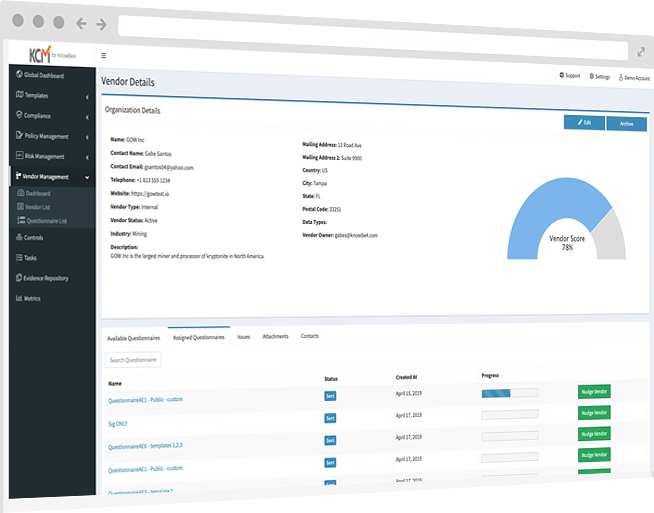 KCM’s Vendor Risk Management module helps you centralize your process to manage your third-party vendor security risk requirements. With a single pane of glass view, you get continuous visibility into your vendors’ controls and evidence libraries and can keep track of their compliance requirements, services they provide, and what data they have access to in one centralized repository. Prequalify risk, assess your vendors, and conduct remediation to continually monitor risk associated with your vendors. With the ability to weight vendor answers to your requirements, you can easily rank risk levels for your vendors. You can also escalate areas of risk to the risk register to increase visibility of vendor risk. Streamline your vendor assessment process with KCM’s automated workflow and campaigns. You can easily design an efficient workflow to conduct due-diligence activities and track and monitor tasks assigned to your vendors to ensure accountability. Set issue status and priorities based on your organization’s security requirements and build repeatable processes to help automate your ongoing vendor assessments. Ensure standard and consistent vendor assessments with pre-built and customizable questionnaire templates. You can create your own custom templates with the form builder or leverage our managed templates, which includes BITS SIG and CSA CAIQ. The key features of KCM GRC allow you to eliminate the business disruption caused by the dreaded compliance curve, keep key employees working on key tasks as opposed to sitting in meetings, and enable visibility into the ongoing audit and compliance processes at all levels of the business. The KCM Dashboards are simple to use and easy to understand. They allow you to quickly see what tasks have been completed, tasks that were not met, and tasks that are past due. With automated email reminders, your users will always be notified ahead of time so that any gaps in compliance can be dealt with immediately. The Evidence Repository allows you to safely and securely store policies, procedures, and compliance/audit evidence for each of your controls and tasks. By having audit evidence readily available for auditors to review, this will limit the amount of time an auditor will need to spend on-site, taking valuable time away from your work day. KCM was designed with simplicity in mind. The more processes you can automate, the more time you save. KCM enables you to assign responsibility for controls to the users who are responsible for maintaining those controls. You can also assign an approving manager to ensure that the documentation the user is providing is acceptable for audit evidence. This leaves no question as to which employee is responsible for maintaining compliance related to each control and provides accountability over the quality of the documentation being provided. You can test the KCM GRC platform for yourself using one of the KnowBe4 pre-built compliance requirements templates. Please request a demo to schedule a walkthrough of KCM to get started.